Channel 4's Mash Up returns tomorrow evening! On January 4th 2013 the Channel 4 Mash Up returns for a night of show-swapping fun from our favourite Channel 4 stars. Hosts for the evening Davina McCall and Kevin McCloud both present from their 'homes' - Davina and her pensioner's workout crew and Kevin from his "modest, hetropolitan, urban crash-lair". Alan Carr causes havoc in a special Chatty Man version of The Million Pound Drop where we see Loose Women (Denise Welch, Sherrie Hewson, Lisa Maxwell and Jane MacDonald) Richard Bacon and Alexander Armstrong take on the Drop in a bid to win £1million for their charities. And in one of the short sketches featured throughout the evening, psychological mastermind Derren Brown tries his hand as a contestant but will he be able to out play and bring The Banker down? 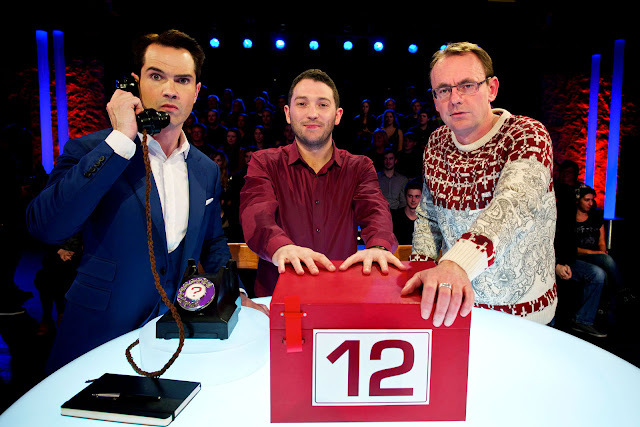 Channel 4's Mash Up also features 8 out of 10 Cats (Jimmy Carr, Jon Richardson and Sean Lock) hijacking an episode of Deal or No Deal; Come Dine With Me where a bunch of mischievous comedians taking on the dinner party challenge with Angelos Epithemiou, Olivia Lee, Pete Firman and Stan Boardman; and Miranda, despite being a woman, takes on the Chatty Man mantle as she digs the dirt on guest Alan Carr in Miranda's Chatty Man Mash Up.